Today, we’re going to look at one of those books that’s so chockfull of good needlework wisdom, you’ll wish the book had been in your hands from the first day you started your journey with needle and thread. 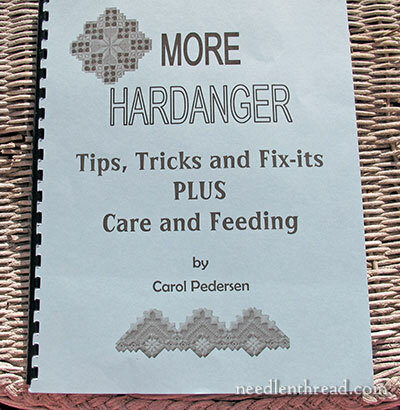 More Hardanger: Tips, Tricks and Fix-its, Plus Care and Feeding by Carol Pedersen is a self-published volume of information pertinent not only to fans of Hardanger embroidery, but to all needlework enthusiasts, collectors, embroiderers, and textile lovers in general. Sounds like a big promise, doesn’t it? That a book written specifically about Hardanger would apply across the board? More Hardanger is a 66-page volume, printed on good-quality paper, covered with card stock and bound with a comb. It’s not a fancy-schmancy book. But it’s the content we’re after! The book is a follow-up to Hardanger: Tips, Tricks and Fix-its by the same author, which is also packed with all kinds of specifically-Hardanger information. More Hardanger begins with information specific to Hardanger embroiderers, with a discussion of tools, fabric, thread, and stitches. 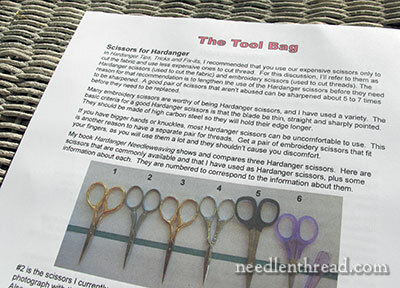 In this section, you’ll find tips on the best types of tools for Hardanger (what scissors are best, what needles to buy, and so forth), guidance on fabric and thread selection, and instruction on the stitches involved in Hardanger embroidery. 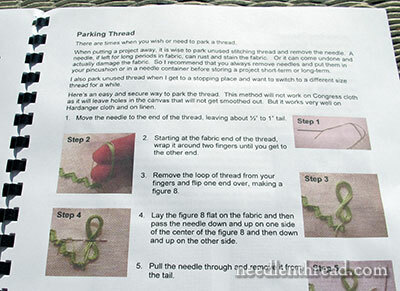 It continues with stitching instruction and all those little tips that make stitching easier – like how to park long threads. The instruction in the book is provided through step-by-step photos and through clear diagrams. The type of instruction in More Hardanger goes beyond what you’d normally find in an embroidery book. It’s like having the teacher sitting with you, sharing all those little bits of wisdom collected through the years, that makes your stitching easier, more fun, more productive, and just downright better. It’s the little nuances that the author shares. Beyond just the simple basics, she shows us the expert’s approach, and she makes it easy! The real meat of the book – the information that every embroiderer will appreciate – is found in the last half of the book. In the Fix-its section, Carol discloses the materials and tools that should make up a repair kit. She explores fixing mistakes in needle weaving and repairing Hardanger fabrics. The concepts can certainly be applied to other types of fabrics and needlework. Care & Feeding – this is where it’s at! It’s a lot of text! But it’s all good text! I found myself reading it all avidly! Provenance is all the background information associated with a piece of art. It’s the history of the piece. The author discusses why it’s important to keep the history of your own creations (and how to do that), as well as keeping track of the provenance of pieces you own (and how to do that). This section includes information on finding professional cleaners and conservators for valuable textiles, as well as deciding the best course of action for cleaning your particular textiles. 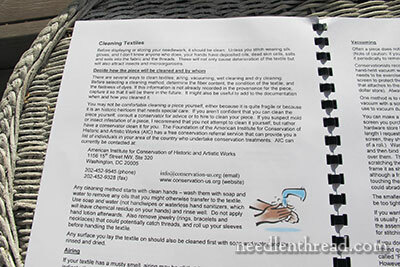 The author includes instruction on vacuuming embroidered textiles, wet cleaning (with all kinds of soapy tips here! ), starch removal, and dry cleaning. This section includes environmental considerations, inspections before displaying and after displaying (what to look for with any damage or what could be damaged), displaying unframed work and framed work. Here, Carol discusses storage environments and materials, packaging for storage, and how and where to store your textile treasures. 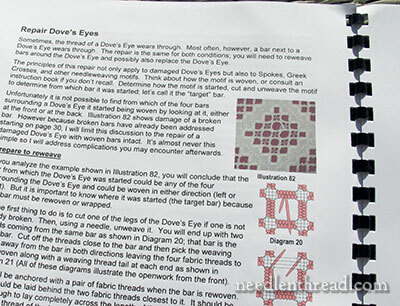 You can see from the list above that this type of information is gold for any needleworker! And it’s sometimes hard to find this kind of information, or to know where to find it, especially if you don’t have an experienced mentor or teacher to discuss these things with. So, that’s the book! And I like it a lot! It’s solid information for all embroiderers and textile enthusiasts, and for folks who love Hardanger, it’s instructional to boot! The pros: the information inside! And not just the information, but the way it’s presented. It’s down to earth, it’s practical, it’s easy to read, and it’s delivered with a good sense of humor. The cons: I’m not a huge fan of this kind of comb binding. The comb is too tight, and after just a few reads, I can see I’m going to have to replace the comb for a larger one and probably replace some of the pages. A spiral binding would make more sense. This is the type of book I’d love to have in a digital format, so that, as time goes by, if a page is torn or damaged, I just have to print another one right here at home. In any case, the information within the pages is certainly worthwhile, and I’m happy to have the copy I have, regardless of the binding. More Hardanger: Tips, Tricks and Fix-its, Plus Care and Feeding is available through Nordic Needle. This is one thing I love about Nordic Needle – they carry many of these self-published and self-printed books, written by experienced needleworkers, designers, and teachers, that are absolute gems when it comes to instruction, projects, and useful information. They might not be the beautiful glossy books cranked out by publishing houses, but they’re still top-notch when it comes to content. And you know what they say – Avoid evaluating tomes with regards to how they are bound and protected. How interesting! Thanks for bringing this book to our attention, Mary. For my next project I want to make a wedding gift for my Niece and I was thinking of hardanger embroidery which I have not tried thus far, so your book review is very timely. It looks a very instructional and informative must have book for hardanger as well as all other aspects of embroidery. I would love to purchase a copy it’s a shame the book is only sold in the US which makes it so much more expensive to buy with the extra cost of shipping and customs but who knows maybe it might become more widely available in the future. Thanks so much for reviewing the book and for sharing your views with us. 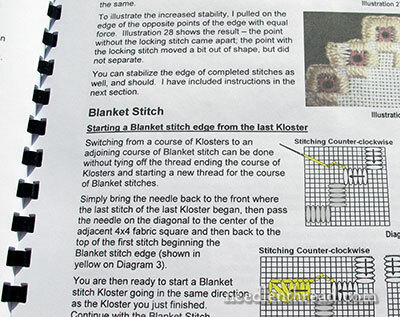 Hi, Anita – I think, if you haven’t done Hardanger before, a beginner’s book would work better. This book is good for beginners, but it’s not the same as taking a technique step-by-step from the beginning. I’m sure you can find plenty of books through sources in the UK for beginning Hardanger. I don’t know if Search Press has any, but they’re usually a good place to start for beginner’s guides. Thanks for the advice and I will look into hardanger for beginners in the UK, I’m sure to find a good source beginners book. I have yet to try hardanger, but it’s definitely on the (long!) list. I can identify when you said you read this book – every crafting book I have has been read (and some several times over). Only an avid needleworker would derive such enjoyment out of reading what, to us, is the equivalent of a best seller. I have a copy of the original version of Tips, Tricks & Fix-Its, which I purchased after Carol Pedersen sat with me for over an hour explaining to me how to best fix a mistake I had made in a large hardanger project. This book is fabulous and I have used it many times since for reference purposes. I like the new additions to the book that you pointed out, Mary, so will have to buy myself the new copy. Having sat in on most of a lecture by Carol on Provenance without enough notepaper to take all of the information down, it is definitely worth the money! She is very knowledgeable. I don’t do hardanger at all, totally not me – but I think I want this book just because of the title! Next Next post: Better Beak Battle!